Gaetano Donizetti; Georges Bizet; Giacomo Puccini; Gioachino Rossini; Giuseppe Verdi; Jacques Offenbach; Léo Delibes;... Very Good. In very good packaging. 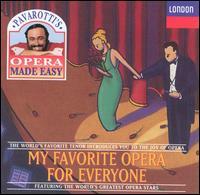 Various-My Favorite Opera for Everyone [IMPORT] by Various. Like New. Like New condition. Audio CD. Case Very Good. Booklet Like New. Quality guaranteed! In original artwork/packaging unless otherwise noted. Very Good. Very Good condition. Audio CD. Case Good. Booklet Good. Quality guaranteed! In original artwork/packaging unless otherwise noted.